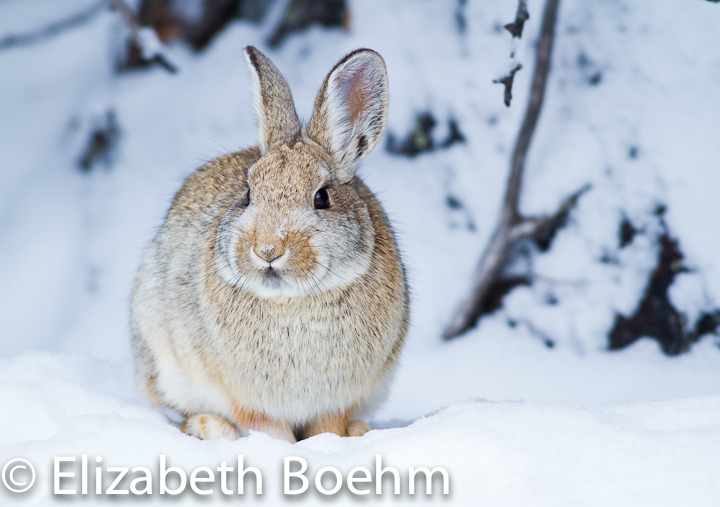 Being out and about one morning, I thought I would check on my cottontail rabbit that likes to elude my camera. This particular rabbit is typically seen posing beautifully on a rock in the sun first thing in the morning. On this cloudy day he was in a quiet spot beside the rocks with a clear path through my viewfinder; his back was towards me but I thought I would see what I could get with my camera. I waited him out, his curiosity finally got the best of him and he turned around and faced my camera. I started photographing him and he eventually decided I was not a threat. He moved closer while nibbling on a variety of shrubbery. I thought to myself this could be a good photo if he just moves closer to the colorful rabbitbrush. As a photographer I had set my sights on a green branch hoping to add color to my gray, day image. Yes, I was getting excited as the rabbit was heading in the right direction and was only about a foot from where I wanted him. He was starting to pose and nibble on his breakfast. All was good with the world! Suddenly he turned his little, white tail to me and bounded into the rocks not to be seen again that morning. In that brief two seconds my guilt started first and I thought “I hadn’t budged”, then “Rats, I lost my shot”, then I looked up from my eyepiece to see a Northern Goshawk fly right over the spot the rabbit had been just 20 feet from me, 2 feet off the ground. In two seconds, I went from guilty and distraught to awe as I watched this large accipter fly close and bank back into the trees behind me. All was right with the world once again!